Why aren't you reading it yet?! The first thing you’ll notice about The Sims 3 is that the Sims now live in a completely seamless, living neighborhood. This means that they can walk next door, walk down the street, drive to the center of town, stroll through the park, and explore everything without ever encountering a load screen. Wherever you go in your town, you will see other Sims going about their daily lives. You’ll discover new things about the community that your Sims live in, and you will have the chance to participate whenever and wherever you like. As a player, this is an incredible innovation for me because now I can see what my neighbors are up to all of the time and go interact with them. Or if I am feeling devious I can peek through the window and spy on their every move. I can even shoot across town to see what the other families in my town are doing, any time of day or night. It’s an entirely new way to play with your Sims! The second aspect of The Sims 3 that always impresses me is our completely reinvented and realistic Create a Sim. In The Sims 3, you have so much freedom to create the Sims that you want to make, yet it’s easy and fun. The Sims can look like anyone you imagine. I’ve made my friends, my great grandpa, and many other important people from my life. We also have a new realistic personality system called Traits that allows you to determine the personality of every Sim. There are dozens of Traits that you can assign to your Sims. Every Trait will change the way that your Sims feel, think and behave in the game. You can choose several traits for your Sims, so it’s really possible to make any character that you can imagine and they will come to life in The Sims 3. Now imagine placing these unique personalities into your very own “Petri-dish” that is the new seamless, living neighborhood. 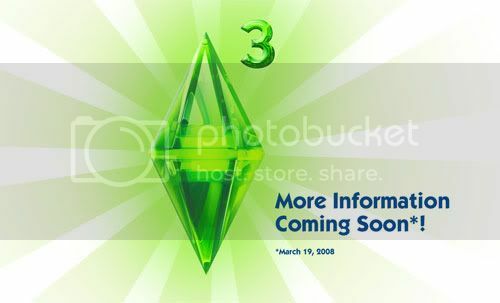 The third thing that I really want to share with you about The Sims 3 is that everyone will be able to customize the appearance of everything, right in the game: This is true for furniture, walls, floors, fashion, hair, and so much more. You will be able to customize the colors or patterns and apply them to everything (this is great for me in particular, as I am colorblind). You can make everything match, clash, or coordinate. It is so easy and fast, and it is incredibly powerful. What is really exciting is that you won’t need developer tools to make big visual changes to the game. We will be giving you a small taste of how this works on the website. However, I cannot wait to show you how fun this feature is when we have the final user interface in the game. The real power of this feature will be obvious when you get your hands on it. Fans of The Sims already make amazing things, and now it will be so much easier for to make and share creations. After this we have just to wait the official open of the official site and new information about this amazing title!